The apartment is located in the historic and pedestrian district of Alfama, the oldest, most typical neighbourhood of Lisbon. It is a very quiet and safe place but full of life and charm. narrow lanes and stairways there are plenty of opportunities to observe the environment and the rhythm of this special, unique and characteristic neighbourhood. From the apartment you can easily walk to Lisbon historic and oldest areas: Baixa (Downtown), Chiado, Bairro Alto and São Jorge Castle. It is close to Sé (Lisbon Cathedral), Fado Museum, National Pantheon, Terreiro do Paço and Miradouros (terraced viewpoints) of Santa Luzia and Portas do Sol. The underground and railway station of Santa Apolónia is just a 5-minute walk from the apartment. The building was completely restored in 2015 and its original façade was preserved. The apartment is located on the 1st floor. The apartment has a double bed and a small wardrobe. 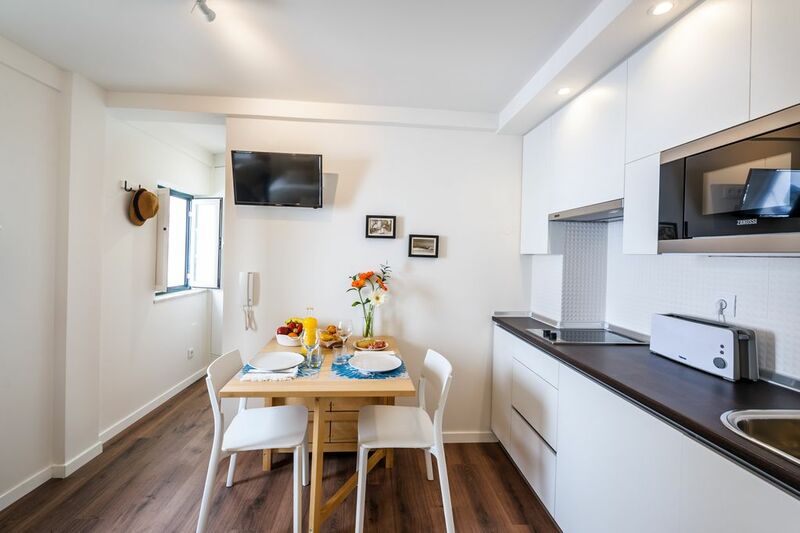 The kitchen is equipped with ceramic/induction hob, microwave, fridge, toaster, coffee machine and kitchenware, which enables you to prepare perfect meals. It has free Wi-Fi, cable TV and hair dryer. Towels and bed linen are provided to make you feel at home. We had a wonderful stay in Alfama. The apartment is a very comfortable studio, beautiful location, close to the main attractions. It was clean and had everything we needed for our stay. It is exactly as the pictures shown, charming and comfortable. The proprietor, Joao, was very pleasant and helpful. We had a wonderful time in the beautiful city Lisbon. Fully recommended. Nous avons apprécié l’accueil digne d’un professionnel malgré notre arrivée tardive, la situation de l appartement, facile d’accès (métro, bus) à proximité du centre ville et au cœur de l’Alfama. L ‘appartement est plutôt confortable, la literie notamment, un bémol cependant concernant la salle de bain vraiment très petite et en particulier la place des wc à cause de la paroi de douche qui est accolée), autre point négatif l appartement manque d aération. The very hospitable and affable host was there to meet me without any fuss or having to call when I got there -- all pre-arranged. he spent copious time answering questions and orienting me to the apartment and the neighborhood. The apartment itself is very comfortable -- the bed, firm with give foam mattress just right for me, is comfortable (one of my main concerns). In terms of kitchen, everything that I needed was there. I wasn't really cooking: mainly bringing back food from stores like the supermarket at the far end of Santa Apolonia Train Station -- sometimes using the microwave. The bathroom is small, but functional. I like the fact that there is a shower head on hose that's movable. Only tiny, very tiny, quibble I have is that I'd like the shower head to have been multiple pressure and spray type. The wi-fi was faster than what I have at home on my wired fiber connection. (but then I live in the US where with telecom we get less for more). Excellent. The aesthetics of the apartment are this wonderful almost minimalist white with various accents like a stenciled black tree painted on one of the walls. All the dishes and towels match the aesthetic. It felt good being there. Someone did a really good and thoughtful design and renovation job. Alfama, the neighborhood, in which the apartment is located, is this very close knit community where people all know each other. Often times, it's like Brooklyn and the Bronx years ago where people are (seemingly) shouting window to window and street to window, etc. It can get loud, but when the windows are closed, I think the glazing and seals effectively quiet things down in the apartment. I would, on the basis of location, recommend this apartment to all who are physically able to walk uphill, as that is how it is accessed on these mostly pedestrianized streets. When I first came to the apartment, I bought a Lisbon transit card and loaded it with EUR20 and used it to take the metro to the Santa Apolonia Station which entailed a transfer between two lines, easy to do but roundabout. With that same card suburban trains are usable quite cheaply, so there is a faster way to get to Santa Apolonia. Take the metro from the Airport to Oriente, Exit metro go upstairs to any platform with a train heading to Santa Apolonia (a terminal stop for all trains in that direction)..It's about a half hour faster.